There once was an SDB church building in a Bududa District village where now only mud and a river remain. This was due to landslides October 2018 in eastern Uganda, triggered by torrential rains and an overflowing river. Many buildings, bridges, roads, crops and livestock were destroyed. At least four of the fifty-one deaths were SDBs and hundreds of people were displaced. Eighteen children were rescued and taken to an orphanage facility operated by SDBs. 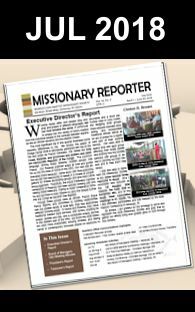 The SDB Missionary Society has coordinated financial support, receiving funds from individuals, churches, USA & Canada Conference United Relief Fund, Australia and Brazil. $2,681 has been sent to Uganda relief effort so far, which was used to transport dislocated persons to relatives or church families (who could temporarily host them), buy blankets, clothes, food, water, and cleaning supplies. Their biggest challenges now are with a lack of latrines (for proper disposal of human waste), for food and eliminating jiggers (small insect that enters the body through the feet, found in areas with low hygiene).